"Yamaha" redirects here. For other uses, see Yamaha (disambiguation). It has been suggested that Yamaha Artist be merged into this article. (Discuss) Proposed since July 2018. Yamaha Corporation (ヤマハ株式会社, Yamaha Kabushiki Gaisha) (/ˈjæməˌhɑː/; Japanese pronunciation: [jamaha]) is a Japanese multinational corporation and conglomerate with a very wide range of products and services, predominantly musical instruments, electronics and power sports equipment. It is one of the constituents of Nikkei 225 and is the world's largest piano manufacturing company. The former motorcycle division became independent from the main company in 1955, forming Yamaha Motor Co., Ltd, although Yamaha Corporation is still the largest shareholder. Nippon Gakki Co. Ltd. (currently Yamaha Corporation) was established in 1887 as a piano and reed organ manufacturer by Torakusu Yamaha in Hamamatsu, Shizuoka prefecture and was incorporated on October 12, 1897. The company's origins as a musical instrument manufacturer are still reflected today in the group's logo—a trio of interlocking tuning forks. After World War II, company president Genichi Kawakami repurposed the remains of the company's war-time production machinery and the company's expertise in metallurgical technologies to the manufacture of motorcycles. The YA-1 (AKA Akatombo, the "Red Dragonfly"), of which 125 were built in the first year of production (1954), was named in honour of the founder. It was a 125cc, single cylinder, two-stroke, street bike patterned after the German DKW RT125 (which the British munitions firm, BSA, had also copied in the post-war era and manufactured as the Bantam and Harley-Davidson as the Hummer). In 1955, the success of the YA-1 resulted in the founding of Yamaha Motor Co., Ltd., splitting the motorcycle division from the company. Also, in 1954 the Yamaha Music School was founded. Yamaha has grown to become the world's largest manufacturer of musical instruments (including pianos, "silent" pianos, drums, guitars, brass instruments, woodwinds, violins, violas, celli, and vibraphones), as well as a leading manufacturer of semiconductors, audio/visual, computer related products, sporting goods, home appliances, specialty metals and industrial robots. In 1988, Yamaha shipped the world's first CD recorder. Yamaha purchased Sequential Circuits in 1988. It bought a majority stake (51%) of competitor Korg in 1987, which was bought out by Korg in 1993. In the late 1990s, Yamaha released a series of portable battery operated keyboards under the PSS and the PSR range of keyboards. The Yamaha PSS-14 and PSS-15 keyboards were upgrades to the Yamaha PSS-7 and were notable for their short demo songs, short selectable phrases, funny sound effects and distortion and crackly sounds progressing on many volume levels when battery power is low. It acquired German audio software manufacturers Steinberg in January 2005, from Pinnacle Systems. On December 20, 2007, Yamaha made an agreement with the Austrian Bank BAWAG P.S.K. Group BAWAG to purchase all the shares of Bösendorfer, intended to take place in early 2008. Yamaha intends to continue manufacturing at the Bösendorfer facilities in Austria. 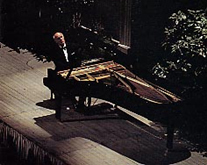 The acquisition of Bösendorfer was announced after the NAMM Show in Los Angeles, on January 28, 2008. As of February 1, 2008, Bösendorfer Klavierfabrik GmbH operates as a subsidiary of Yamaha Corp.
Yamaha Corporation is also widely known for their music teaching programme that began in the 1950s. Yamaha electronics have proven to be successful, popular and respected products. For example, the Yamaha YPG-625 was awarded "Keyboard of the Year" and "Product of the Year" in 2007 from The Music and Sound Retailer magazine. Other noteworthy Yamaha electronics include the SHS-10 Keytar, a consumer-priced keytar which offered MIDI output features normally found on much more expensive keyboards. Kandō (感動) is a Japanese word used by Yamaha Corporation to describe their corporate mission. Kandō in translation describes the sensation of profound excitement and gratification derived from experiencing supreme quality and performance. Some reasonable English synonyms are "emotionally touching" or "emotionally moving". YSP-2200//G: an award-winning innovation from Yamaha. Yamaha expanded into many diverse businesses and product groups. The first venture into each major category is listed below. Yamaha announced the singing synthesizer Vocaloid for the first time at the German fair Musikmesse on March 5–9, 2003. In Japan, the company maintains three factories for musical instrument manufacture, engine and various vehicle manufacture (motorcycles and marine products), with all factories located in Shizuoka Prefecture. ^ "Notification of Change in Representative Director" (PDF). Yamaha Corporation. Retrieved 2013-07-15. ^ "Annual Report 2014" (PDF). Yamaha Corporation. ^ "Yamaha Corporate Information". Global website. Yamaha Corporation. ^ a b "Brand and History - About Us - Yamaha Corporation". www.yamaha.com. Retrieved 2018-07-01. ^ "Yamaha Motor". Forbes Global 2000 List. ^ "Yamaha Corporate History". Yamaha Corporation of America & Yamaha Corporation. Retrieved 2011-04-26. ^ Verna, Paul (1999-04-03). "CD-R Enjoys Massive Growth In A Wide Range Of Markets". Billboard. Retrieved 21 March 2018. ^ Gordon Reid, "40 Years Of Gear: The History Of Korg: Part 2", Sound On Sound, no. November 2002, 1987 ... However, in 1987, the relationship took another huge step forward when Yamaha bought a controlling interest in Korg Inc, effectively making it a subsidiary.”,“1993 ... the previous five years had been very successful, and Tsutomu Katoh now had some cash at his disposal. In fact, he had enough to buy out the majority of Yamaha's share in Korg. So he did. ^ "YAMAHA to Close Archery Products Business". Yamaha Corporation. 2002-02-01. Archived from the original on 2004-01-16. Retrieved 2008-04-30. ^ "Cancellation of Joint Venture Contracts for Sales Subsidiaries in U.K. and Spain". Yamaha Global website. July 10, 2007. ^ Barrett, Andy (July 10, 2007). "Yamaha buys out Kemble family". MI Pro. ^ "Competition For Bosendorfer". Forbes. 2007-11-30. ^ "Yamaha Reaches Basic Agreement with Austrian Bank to Purchase All Shares of Bösendorfer". Yamaha Global website. December 20, 2007. ^ "Bosendorfer Klavierfabrik GmbH". Business Week. March 3, 2008. ^ "YPG-625 - 88-key Weighted Action Portable Grand". Yamha Corporation of America & Yamaha Corporation. ^ "Yamaha Corporate Mission". Yamaha Motor UK. ^ "Yamaha Music Foundation History". Yamaha Music Foundation. ^ a b "Yamaha History". Corporate Information, Global website. Yamaha Corporation. Retrieved 2012-11-13. ^ "New Yamaha VOCALOID Singing Synthesis Software Generates Superb Vocals on a PC". Business Wire. AllBusiness.com. March 4, 2003. Retrieved October 25, 2010. ^ "新型ボーカロイド「VY1」公開です!" [New Model Vocaloid "VY1" Presentation!] (in Japanese). Bplats. August 13, 2010. Archived from the original on July 17, 2011. Retrieved August 13, 2010. ^ Okada, Yuka (August 13, 2010). "キャラクターなしのVOCALOID「VY1」　初のヤマハ製、9月発売" ["VY1", a Vocaloid With No Character, First Yamaha-Made, Sold in September] (in Japanese). IT Media. Retrieved September 5, 2010. ^ "デジタルコンテンツEXPO：VOCALOIDがiPad／iPhoneアプリに　ヤマハが開発" [Digital Content Expo: Vocaloid Becomes iPad/iPhone Applications. Yamaha Develops Those] (in Japanese). IT Media. October 14, 2010. Retrieved October 17, 2010. ^ "Y2 Autumn 2010 | Digital Content Expo 2010" (in Japanese). Digital Content Expo. Archived from the original on 2010-10-07. Retrieved October 17, 2010. ^ "iVOCALOID-VY1" (in Japanese). Apple Inc. Retrieved December 13, 2010. ^ "iVOCALOID-VY1t" (in Japanese). Apple Inc. Retrieved December 13, 2010. ^ Matsuo, Kōya (April 15, 2011). "コードネームは「勇馬」　ヤマハ純正のイケメンボカロ「VY2」の話を聞いてきた" [Codename Is "Yūma". I Heard the Story of the Yamaha Pure Cool Vocalo "VY2"] (in Japanese). IT Media. Retrieved April 28, 2011. Wikimedia Commons has media related to Yamaha Corporation.